Encore Exporter exports LUNAR BMD and body composition data from any GE LUNAR Prodigy database to an Excel file. Encore Exporter is an easy-to-use tool that lets you export GE Prodigy BMD and Body Composition data from an enCore lunar.mdb database, to a Microsoft Excel-compatible CSV file; From there, saving to an .xls or .xlsx is a one-step process. Exports of this sort are often useful when conducting research using bone densitometry data. Including and excluding of specific regions of interest (ROIs). 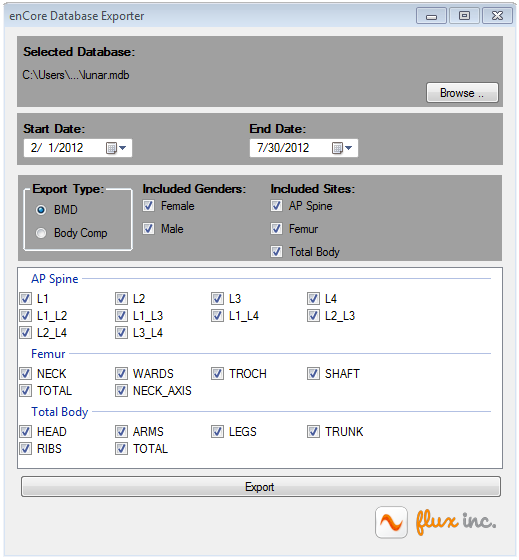 The exported data contains one exam record per data row, with regions and body composition attributes separated into columns. enCore Exporter is compatible with enCore versions 10 and higher. If you are using an older database, then please contact us for a compatible version. Please download a copy from our file downloads section if you would like to evaluate Encore Export with your own database; a ten-row limit on the export file is imposed prior to purchase.